In 1991 we took the Sealink ferry from Hoek van Holland to Harwich for another visit to England. 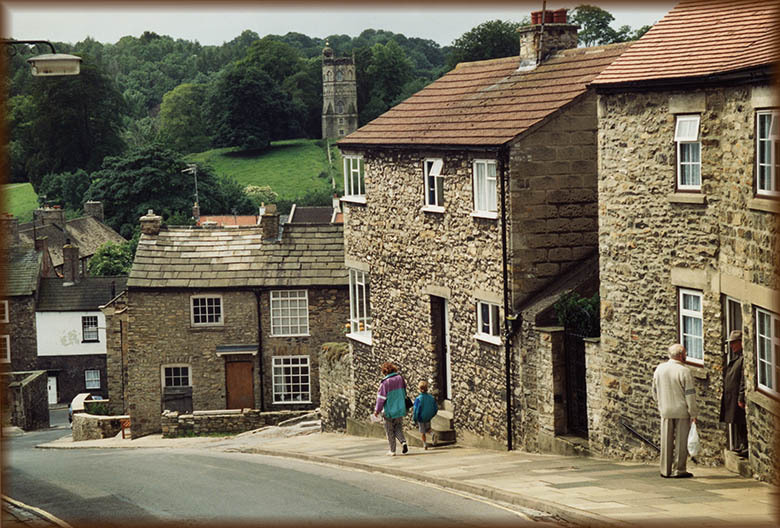 To Yorkshire this time, to explore castles, medieval churches, ruins, pubfood as well as visiting friends. This church was across the road from Gosfield Lake Leisure Park. 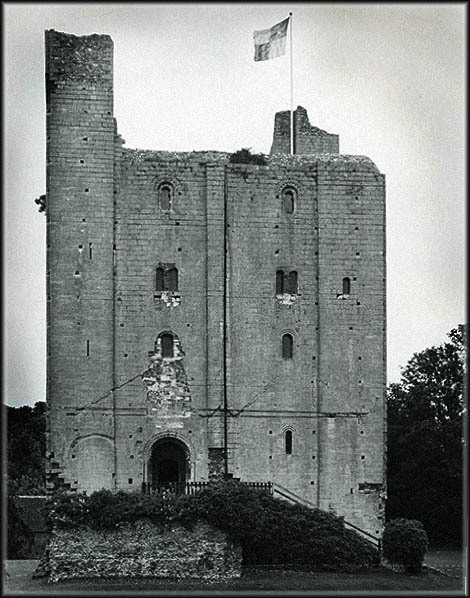 Hedingham Castle in Essex, England, is a Norman motte and bailey castle with a stone keep. 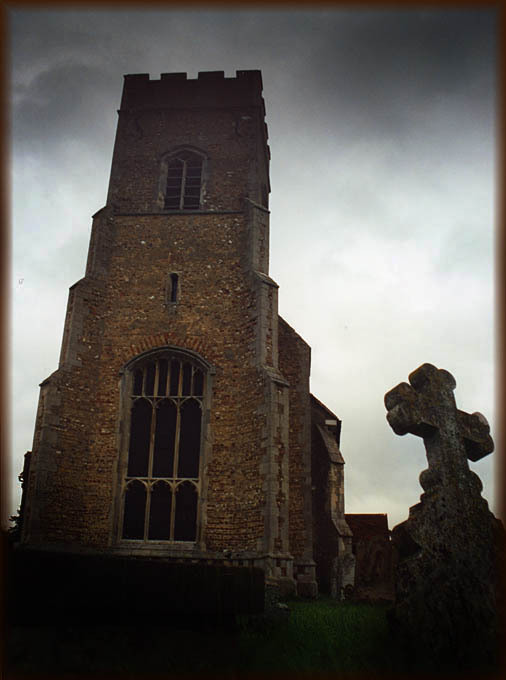 It may occupy a site of an earlier castle believed to have been built in the later eleventh or early twelfth century by Aubrey de Vere I, a Norman baron. The keep stands approximately 35 m high and commands the countryside around it from its elevated position atop the ringwork. It is constructed from flint rubble bound with lime mortar, but, very unusually for an Essex castle, is faced with ashlar stone, which had to be transported from Barnack in Northamptonshire. The keep has four floors, including a fine hall known as the Great Hall or Banqueting Hall with a central archway extending two stories and a fireplace. 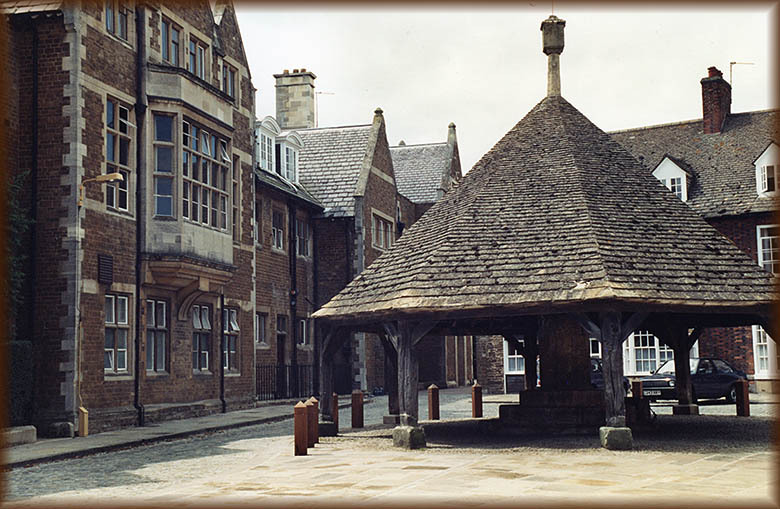 The top floor may have been added around the 15th century, replacing an impressive pyramid-shaped roof in order to provide extra accommodation. The road to 'The North'. We are always inspired by the cottages and fine gardens here in England. Somewhere en route, where we had a break for some tea or coffee. 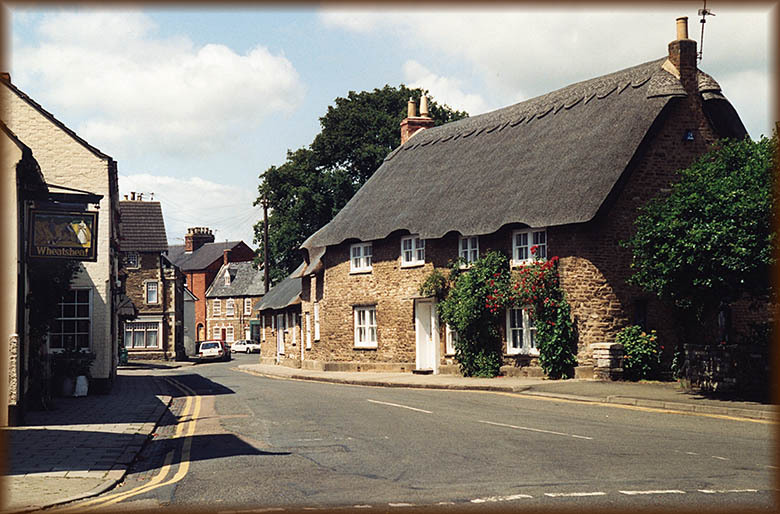 Although the 'bypass' was introduced in the UK decades ago (among great controversy because loss of traffic also meant loss of trade), many smaller roads still pass through town, inviting a brief stop and wander round. Belvoir (pronounced 'Beaver') Castle. Another castle dating back to Norman days. This stately home is located in the English county of Leicestershire, overlooking the Vale of Belvoir. A Norman castle originally stood on the high ground in this spot. During the English Civil War, it was one of the more notable strongholds of the king's supporters. 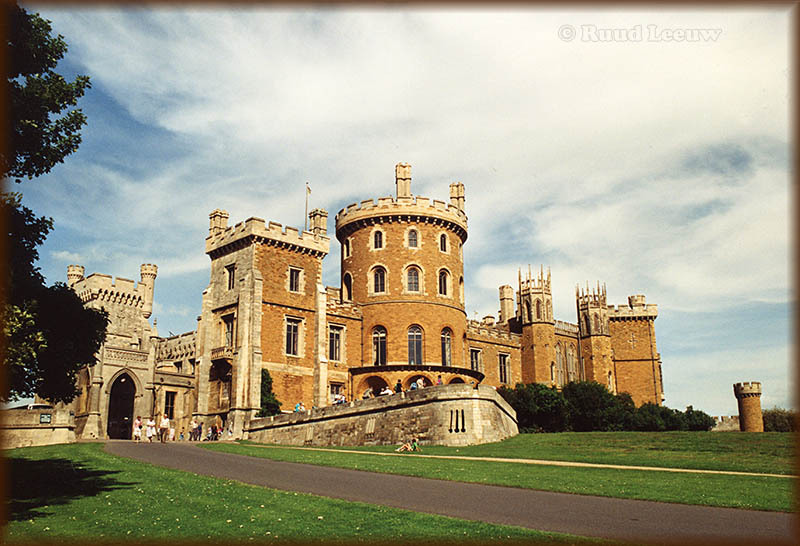 It eventually passed into the hands of the Dukes of Rutland and following a fire, was rebuilt by the wife of the 5th Duke, and gained its present Gothic castle look. The castle is open to the public and contains many works of art. It had been a busy year for us thusfar and preparations for this trip suffered because of that. Normally I would set up the tent before we pack it for the trip, but this time I had failed to do this... When I put up the tent upon arrival on British soil, we found the tent incomplete and unusable. Fortunately that campsite had large static caravans for hire, so we were 'saved' for the night. This rather suited us and we kept the tent in the car for the remaining part of the trip and resorted to similar accommodation or B&B. It would have been cheaper, in the end, to buy a new tent but this novel way of travelling was quite nice for a change. The above photo was taken at Akebar Park. For a night they charged us UKL 35,- a night and offered little for a child in terms of playing grounds, so we stayed only two nights and went elsewhere. 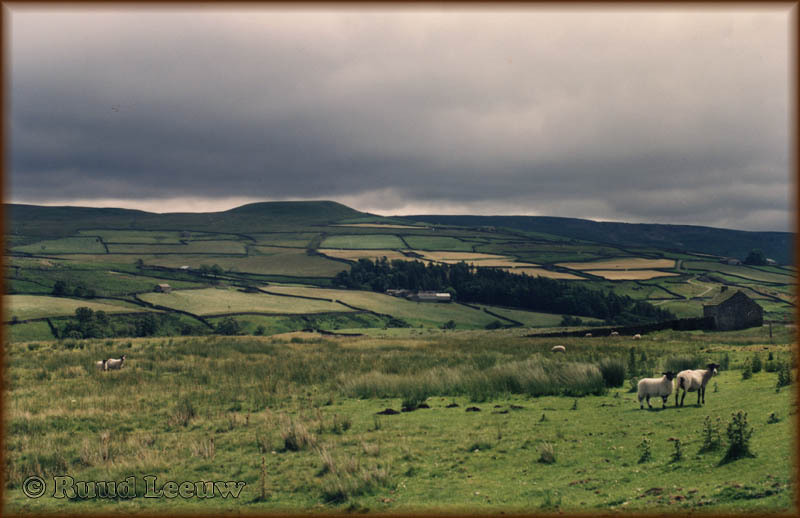 From Akebar Park we also visited Bolton Castle and Middleham Castle, but rain spoiled the photo opportunities. 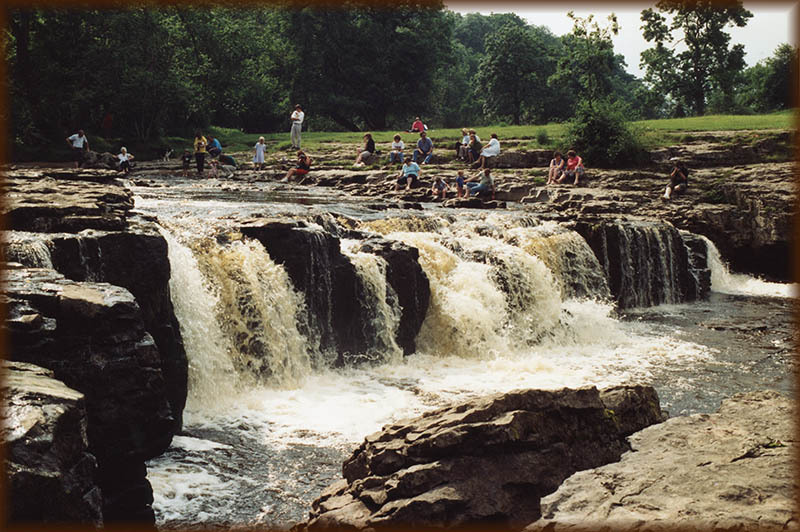 Aysgarth Falls. We also walked the 'Woodland Trail' here. We also enjoyed the best 'scones & homemade marmalade' ever! Along the campsite was this exquisite little church. With a storm threatening and the sun setting, I was at the right place at the right time..
My photos at this time were taken using an Olympus OM-2N (previously I used 2 OM-1N bodies, for photos and slides) with a recently acquired Sigma 35-70mm zoomlens. I was quite pleased with the results. The film used was Ektar 125 ASA. I later changed to the Olympus OM-4. A Hasselblad for medium format was bought secondhand, but I could not afford more lenses. So a Mamiya 645S was bought to replace the Hasselblad, but for slides I bought a Nikon FM-2 too. The FM-2 was sturdy but also very heavy, so by the end of the 1990s it was replaced by a Canon EOS 5. When I changed to digital photography, it also meant the end of the Mamiya 645S. 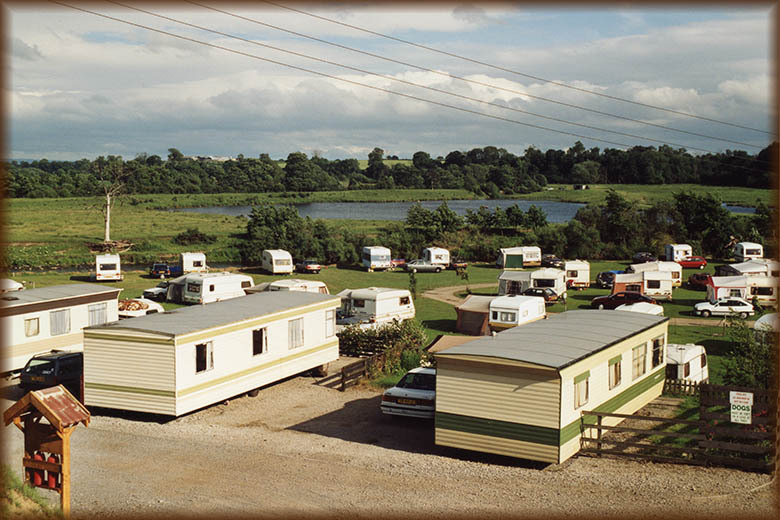 Brompton-on-Swale Caravan Park (Richmond, Yorkshire) and the pleasant countryside surrounding it. Richmond, Yorkshire is a very nice city. We are seen here making our way down to the river Swale. 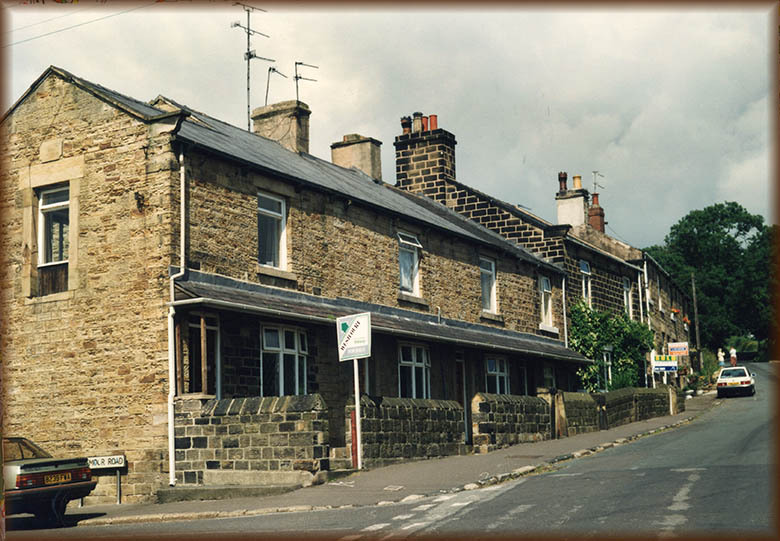 But at times it was hard to photograph a street such as this, as many houses featured a large satellite disc! Abolutely spoils the photo I was aiming to take! 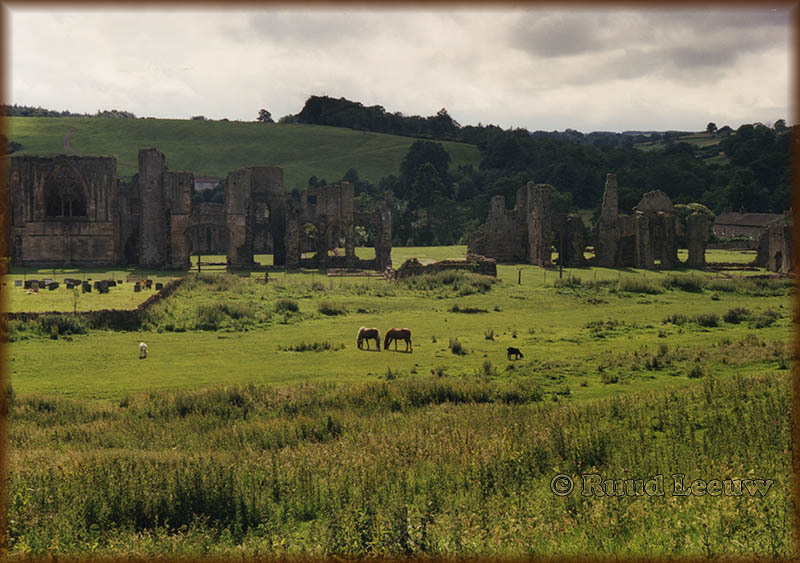 Easby Abbey or the Abbey of St Agatha is an abandoned Premonstratensian abbey on the eastern bank of the River Swale. 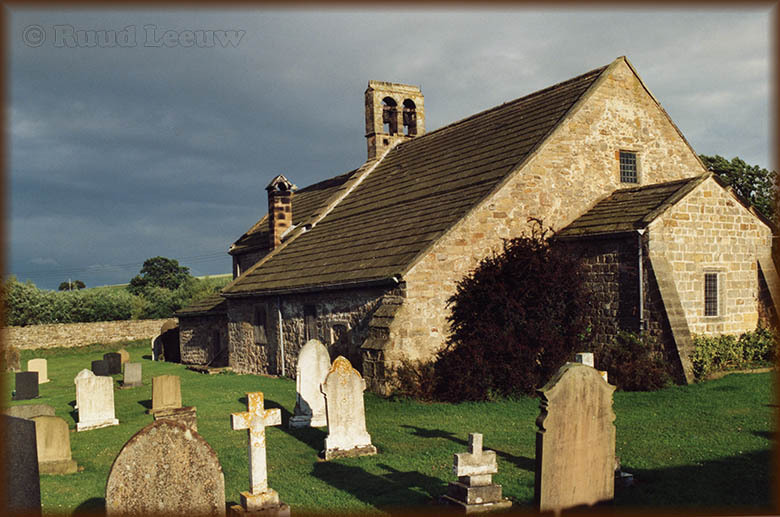 The Abbey of St. Agatha, Easby, was founded in 1152 by Roald, Constable of Richmond Castle. The inhabitants were canons rather than monks. 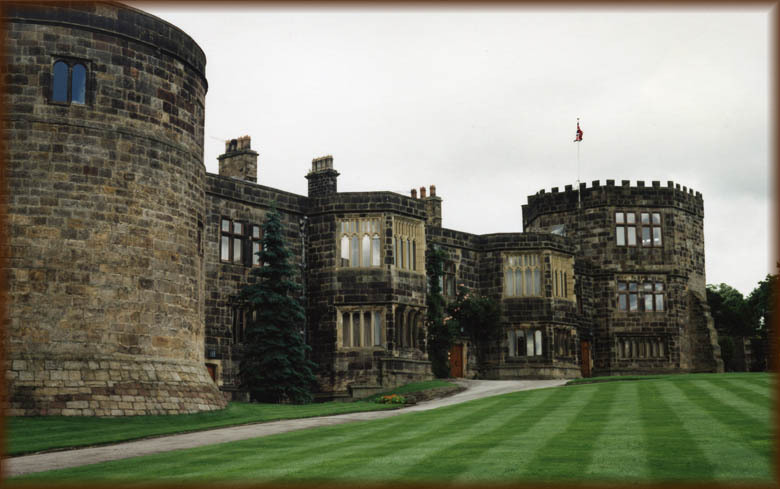 Skipton Castle is situated within the town of Skipton, North Yorkshire. The castle has stood for 900 years, first built as a Motte and Bailey castle in 1090 by Robert de Romille, a Norman baron. The castle was soon replaced with a stone keep as the old Motte and Bailey constructed was not enough to withstand the attacks from the Scots to the north. In 1310, Edward II granted the property of the castle to Robert Clifford, who ordered many improvements to the fortifications (but died in battle before seeing them completed). We exited the Yorkshire Dales and headed south. The trouble with finding B&B, we found, was that you see plenty of them when you don't need them and nowhere in sight when you want to stop for the night.. We found accommodation here, in a hamlet called Crane Moor ('Poplar Cottages'), near Sheffield. 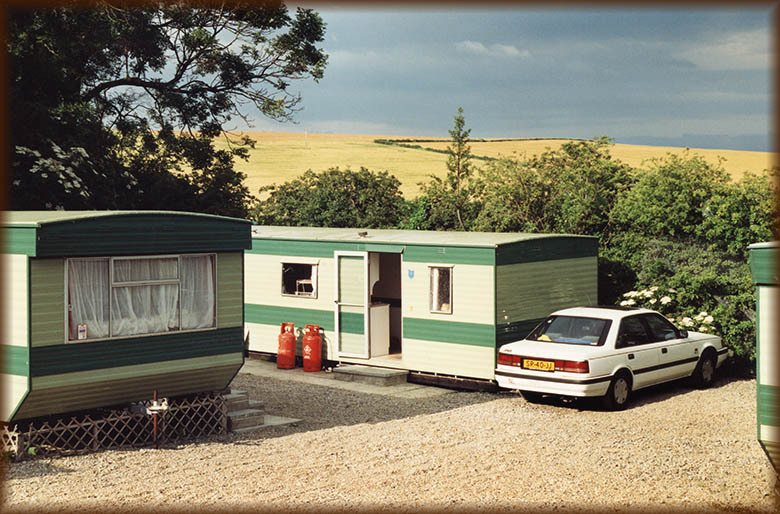 The fact that these B&B adresses (and even some of the caravans we stayed in) had tv quite suited our son, Alexander. We liked the comfort, compared to sleeping in a tent, as we were suffering from a cold.The financial suffering, when we looked at our withdrawals because of the extra expenses, awaited our return at home. 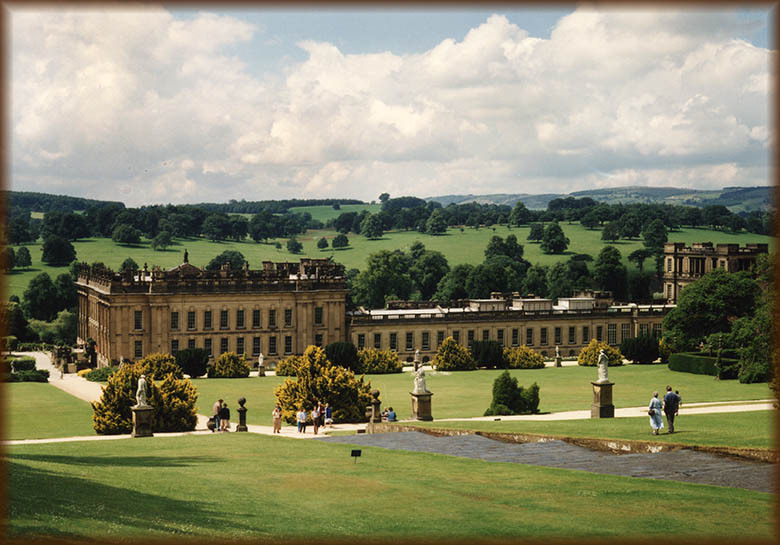 En route from Crane Moore to our friends in Marcham, Oxfordshire we visited this stately house in Derbyshire. After a stay with our friends (a hand at cricket failed miserably for me and kiteflying was cut short because the wires became an untangible mess; the plan to visit the air show at RAF Fairford was abandoned too), we took the Olau ferry from Sheerness to Vlissingen ('Flushing'). We found this crossing much more pleasant compared to the Hoek van Holland - Harwich Sealink ferry we had at the start of this trip. And it was dfl 100,- cheaper too! All in all a trip with many ups and downs, but look back upon it as very enjoyable.